Ray Martin is an American professional pool player. He acquired his nickname, “Cool Cat,” when he won a 1971 world title in the middle of an earthquake. In addition to holding the title that year, he held it in 1974 and 1978. He was inducted into the Billiard Congress of America’s Hall of Fame in 1994. He is the coauthor with Rosser Reeves of The 99 Critical Shots in Pool, first published in 1977. Back in the early ’90s, Incan Monkey God Studios began as the publications department of Origin Systems, creating documentation and game guides for all the Ultimas, Wing Commanders, and other games that Origin produced. A few years after Origin became part of EA, IMGS spun off and formed an independent design house. Even while working with EA, IMGS created guides for Prima Games, and that continues to this day. IMGS created the original guide for Ultima Online, the first really massive online game, and one of its first projects for Prima post EA was for the initial EverQuest expansion, The Ruins of Kunark. Since that time, IMGS has created guides for all sorts of PC and console games, but the majority of its work has covered MOGs of all shapes and sizes. Rosser Reeves was one of the earliest pioneers of television advertising, earning millions of dollars for his clients over a long career. 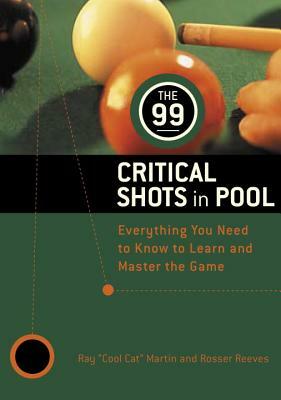 He was the chairman of the Ted Bates marketing agency, now known as Bates CHI & Partners, and the author of Popo, a novel, and The 99 Critical Shots in Pool.